From la Grande Halle de la Villette: the endless joy of Run The Jewels, the magnificence of Princess Nokia, the cosmic power of Kamasi Washington. Pitchfork Festival takes place in the Grande Halle de la Villette in Paris’ northern, formerly industrial district. A former slaughterhouse and beef market, it now stands as an imposing cultural chamber, within which Pitchfork have imposed identical stages at either end. Five minutes after the act on one stage finishes, the act at the opposite end begins. This is a good idea for two reasons. Firstly, and most obviously, it eliminates the waiting times. Gone are the 20 minute transitions as the dull repetitive clunk of the roadie’s foot on the bass drum pedal thuds out of time above the DJ’s choice of Pitchfork’s ‘Best New Music’ section. Secondly, it means that everyone in attendance watches everyone who plays: there’s simply no other option. It’s a varied line-up that spans jazz, hip-hop, indie, dance, pop and the avant-garde, and everyone get an enthusiastic audience. It’s unclear whether it’s simply an atypically unbiased group that’s shuffling back and forth and back again, or whether the programming invites this sense of open-mindedness, but it’s heartening to see such a level playing field. The hip-hop fans watch the indie bands, the jazz fans watch the pop singers and vice versa, all of whom are given exactly the same stage to work with, as avant garde or as mainstream as you like. That’s not to say there isn’t the occasional damp squib. The wholesome Scandi-pop of Sigrid, however affable she is as a performer, is pretty placid – although she was cut short before she could play what I’m informed by some cooler people is her biggest hit – while Chassol’s longform audiovisual birdsong jazz noodling ploughs a particularly tedious furrow. But there’s something to be said about forcing people out of their comfort zones, and often results in an exciting discovery therein. Take SÔNGE, for example, a French newcomer who plays relatively early on the second day. Were there another option to what on paper appeared to be solid, slick, derivative electronic pop, I would have taken it. When she plays, however, it’s invigorating to have my expectations dashed. Playing alone with a small rig, with streams of white, fluorescent light streaming over her face from a pair of modish rectangular shades, though there are indeed shades of influence from Santigold and M.I.A. she’s more subtle than the former and more smooth than the latter. Given the interstage shuffling and the swiftness with which the next set follows, those that want to cement a good spot must leave early to beat the mass migration. As the evening wears on and the names get bigger, this becomes a problem. 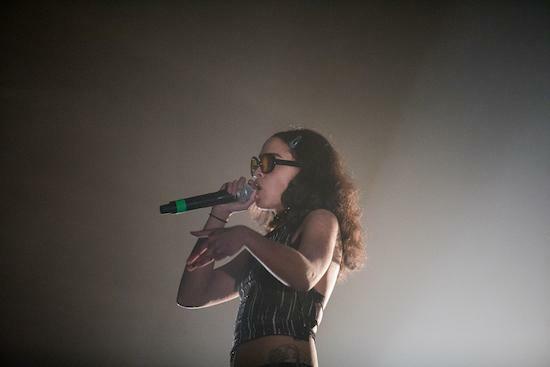 On the final night, Princess Nokia is followed by Run The Jewels. Her set is among the finest of the entire weekend (more on that later), but with a good 20 minutes left to go, it’s hard to focus on her sublime, magnetic performance, such is the jostling as around a third of the crowd start to make their way back out again to the other end of the hall. I’ve seen Run The Jewels five times this summer. They seem to appear everywhere, from nobly attempting to draw a crowd away from Aphex Twin’s hangar of madness at Field Day to following Jeremy Corbyn at Glastonbury (still the biggest crowd there since The Rolling Stones), theirs is a ceaseless omnipresence on the festival circuit. And it’s a welcome presence - they’re a revered force in modern hip hop for a reason, capable of delivering a genuine powerhouse of a set - but every time I plan to see them again, there’s a niggling feeling that the novelty might wear off this time around. As El-P and Killer Mike vault on stage, clattering bundles of ceaseless energy, they cast the exact same spell they’ve hurled on countless stages worldwide. And it is the exact same thing, stage patter and all, aside from a righteous dedication from El-P to the hardiness of the people of Paris. It’s the same crunching, shuddering beats, the same faux-antagonistic sparring from the two MCs, but dear God it’s so entertaining, fifth time around. Beyond Run The Jewels, it’s the hip hop among Pitchfork’s diverse programming that proves the most compelling. This thanks in no small part to the magnificent Princess Nokia - of all the acts this weekend, she feels far and away the most vital in 2017. Killer Mike and El-P are equally entertaining, sure, but there’s a particular power to Princess Nokia’s Saturday night set, the hunger of an artist who knows she’s in the ascendency and wants to capitalise on her own potential. She could be a defining artist of her generation, and on the evidence of this set - full of eagerness, intensity and poise - she knows it. Meanwhile, Loyle Carner’s set is a delightful surprise. His earnest brand of hip hop doesn’t have the same epochal might as Princess Nokia’s, and it’s easy to dismiss his more palatable, less aggressive focus on obvious mass appeal, but for a performer so young to boast such a slick, measured blend of heartfelt poignancy and irresistible fun is to be admired. There is no one at this festival, however, quite so transcendent in their magnificence as Kamasi Washington. It’s hard to think of many artists operating on earth who boast such otherworldly gifts for transporting live performance. His EP released this year, Harmony Of Difference, is so named because its five entirely separate melodic lines are so written that their diversity can be harnessed to interweave into a sublime singular whole. Washington introduces a performance of material from the record with a speech about the importance of celebrating and embracing our differences. It’d be hackneyed and cliché were it from any other mouth, or followed by anything other than a demonstration of truly cosmic power.